Nicole's Needlework: Sometimes I think I'm crazy! I just took the kids to Cici's Pizza for a treat and to get out of the house. Well, it seems these child care centers have the same idea. Last time I took them to Mcdonalds there was three buses full of kids and this time there was at least one or two buses. I need to start bringing the Tylenol with me! Anyway, I decided to take them down to Target - well of course Jake sees something he can not live without and proceeds to throw a temper tamtrum. Screaming and crying and pushing at me to stop me from walking out of the store. And of course our car is way down by Cici's, so we're walking the whole way with him doing this. What makes it worse is me being hugely pregnant and people must be thinking I'm nuts for having another when I can't control the one I have! He fell right to sleep when we got in the car and got going. I guess I should've just stayed home, oh well. 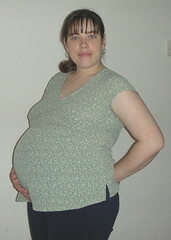 Hugely pregnant me at 36 weeks today - total opposite of how I looked dragging a screaming three year old down the sidewalk. In other news... remember how I said I was a little bad and ordered that pattern and threads? Well, now I've been REALLY bad and ordered The Village of Hawk Run Hollow pattern, threads, and linen from Needlecraft corner. I swore I wasn't going to do it because I haven't even finished the first house of The Houses of Hawk Run Hollow. I know the main reason I haven't finished is because I'm using DMC, and I should've gone with the silk. I'm going with the silk this time. I've heard there are problems with getting the linen, so I ordered a different color linen - 36 ct. Light Examplar by Lakeside Linens. Drema (shop owner for Needlecraft corner) advised against it because I would only have a 2 inch border with the only cut she had, but that doesn't bother me. I don't plan on using a mat when I frame it. Dh was so sweet and told me to get it - probably because he feels sorry for me being hugely pregnant and all! :) Well, I think I need to go on the wagon now. I've done enough damage for quite awhile!! :) Write more later - going to try to get some stitching done! I've got my silks and I'm now anxiously awaiting my chart and fabric - hope the linen doesn't take too long to arrive! You are really blazing through Quaker Garden. You will be done before the SAL even starts! Hee! Congrats on getting The Village and assorted stuff to go with it. It is going to be beautiful!